Got a man that likes to keep his beard, mustache or face looking nice? 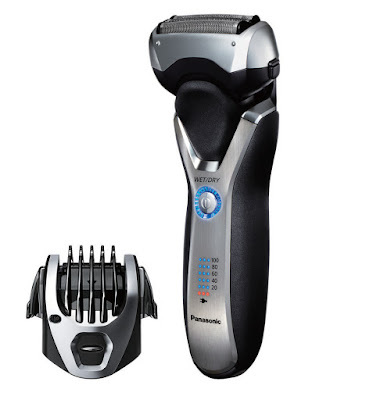 Then check out this Panasonic Arc3 3-Blade Shaver w/Trimmer! With three ultra-thin, nano-polished stainless steel blades — each designed with an ultra-sharp 30° angled edge to cut whiskers cleanly at the base — the sleek, full-featured Arc3 ES-RT77 Wet/Dry Shaver combines pure shaving power with the gentle comfort and convenience of multi-blade precision. This rechargeable shaver is specially designed for better results on all types of beards and thicknesses. Its hypo-allergenic Multi-Fit Arc foils faithfully follow the contours of the face as a pivoting head and Nanotech™ inner blades shave closely and smoothly, even on the most sensitive skin. And with shaving power of a high-performance 10,000 RPM motor and built-in, slide-up 45° trimmer, you'll enjoy a quicker, more satisfying shave and trim. Plus, with its 100% washable, wet/dry versatility, you can confidently use the Arc3 in the bath or shower, over the sink and on the go. You can purchase Panasonic Arc3 3-Blade Shaver w/Trimmer for $119.99 from the Panasonic online shop.